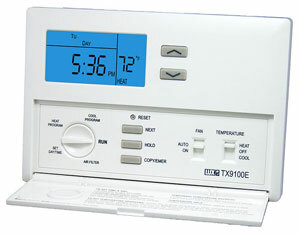 Fully-programmable energy saving thermostat that is compatible for use with almost every home heating and cooling system, including heat pumps! 7-day programmable, the TX9100E helps save energy by allowing a homeowner to select times and temperatures that best match their daily schedules and comfort levels. The result is a more energy efficient heating and cooling system that uses energy when it's needed most. The TX9100E also includes special features for ease-of-use and convenience, like the exclusive Lux Speed Dial®, Quick Copy Programming, large easy-to-read lighted display, filter monitor, programmable keypad lock, temporary temperature override, and much more. Last but not least the TX9100E is simple to install, extremely accurate and very reliable for year after year of home comfort and energy savings.